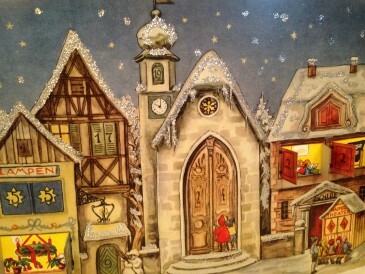 I have a fondness for German advent calendars, having spent four happy childhood Christmases in Germany where my dad was stationed. This calendar pictured above is much like those I remember. We opened a little window each day, and the culmination was the church doors opening Christmas Eve to a manger scene. This is a great metaphor for our own Advent celebrations. Each day should open onto a happy scene, looking forward to the big event, the appearance of the Christ child Himself. Since this is obviously true, we should determine that all our Advent celebrations will be about joy and with joy. Look at your list of things to do each day, and determine to do each one with joy. If fact, if you can’t do it with joy, scratch it off the list. Joylessness is out of place. It would be like opening a window on the Advent calendar to find a troll. It’s easy to excuse a lot of fussing over the massive pile of gifts to buy and wrap, cookies to bake, cards to mail, trees to put up and decorate, and all the rest. But pause for a moment. Each day opens up looking forward to the appearance of the Child. Joyful anticipation should be building. Take joy with you in every task. Bestow it on every preparation. And remember, if you can’t do it with joy, don’t do it at all. But can I add one thing? From someone who struggles with joy… Don’t do it unless you can do it with joy OR ask/beg/plea for God to give you joy and then step out in faith and do that thing, trusting that God will give you joy. This is a prayer He delights to answer. Thank you for this encouragement. My son’s birthday is during the advent season and for some reason, this year I have experienced anxiety at an all time high. I am crossing things off my list (as in, not doing them) left and right. I don’t want to lose my joy and settle for simply “getting through til Christmas.” What a bleak prospect. Thanks for the good reminders. Thank you! I was just trying to figure out how to do all the fun things my children have been invited to do this weekend, whilst also making sure they get to see enough of their grandparents, who will be visiting. You’ve helped me to admit that we can’t do all of those things! I’m off to cross some things of the list. I recently discussed this concept with a friend, and it seemed that she felt her ability to take joy in her activities was contingent on how much she actually enjoyed doing them. In other words, if something was hard or challenging, she would immediately excuse herself from the job because she didn’t find joy in it. I know this isn’t the correct response to difficulties. How does one not misapply the concept that you’re teaching in this post? How do you differentiate between a job that is simply difficult and gives you an opportunity to fight for joy vs. one that is literally robbing you of your joy and needs to be laid aside? If your friend excuses herself from those things that she finds too challenging, then it is possible that she knows her frame and is acting with wisdom. On the other hand, perhaps she is being cowardly. But if that is the case, I would expect that the Holy Spirit will deal with her about this. My point is not to shirk our duties. My point is that if I cannot do it with joy, then I should either get the joy from the Lord, or remove it from my list. God is not glorified by Christmas cards that I grumbled over sending. Though Christmas cards are optional, some things are not optional. And since I would never dream of scratching those things off my list, I am determined to get joy in them!If I know a particular job is the right thing, then I should want to do the right thing with the right attitude.